What happens when you take some the best adventure writers in the world, and set them loose to assemble a book of masterpiece-level challenges for players? Quests of Doom, that's what happens! This book is packed with 18 adventures by acclaimed and award-winning authors Ed Greenwood (The Forgotten Realms Campaign Setting, The City of Splendors), Bill Webb (Rappan Athuk, The Lost City of Barakus), Matt Finch (Swords & Wizardry, Tome of Adventure Design), J. Collura (Caverns of Thracia Reloaded, Chaos Rising), Michael Curtis (The Dungeon Alphabet, Realms of Crawling Chaos), Casey Christofferson (The Tome of Horrors, City of Brass), Steve Winter (Tyranny of Dragons, Murder in Baldur's Gate), James M. Ward (Gamma World, Pool of Radiance, Castle Keeper's Guide), and Skip Williams (Axe of the Dwarvish Lords, The Rod of Seven Parts). 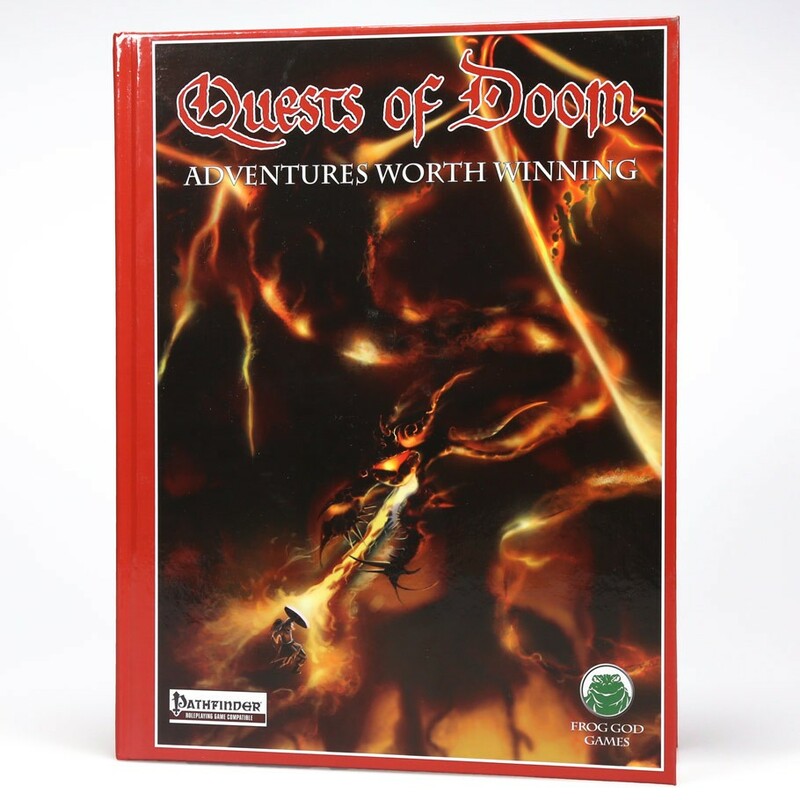 This book is produced as a single volume for Pathfinder RPG and Swords & Wizardry. It was broken into two volumes for Fifth Edition (See Quests of Doom Volumes 1 & 2). Note: The Pathfinder Roleplaying Game version has a red border while the Swords & Wizardry version has a black border.